The days of self-assembling nanoparticles taking hours to form a film over a microscopic-sized wafer are over. Researchers with the U.S. Department of Energy (DOE)'s Lawrence Berkeley National Laboratory (Berkeley Lab) have devised a technique whereby self-assembling nanoparticle arrays can form a highly ordered thin film over macroscopic distances in one minute. Ting Xu, a polymer scientist with Berkeley Lab's Materials Sciences Division, led a study in which supramolecules based on block copolymers were combined with gold nanoparticles to create nanocomposites that under solvent annealing quickly self-assembled into hierarchically-structured thin films spanning an area of several square centimeters. The technique is compatible with current nanomanufacturing processes and has the potential to generate new families of optical coatings for applications in a wide number of areas including solar energy, nanoelectronics and computer memory storage. This technique could even open new avenues to the fabrication of metamaterials, artificial nanoconstructs that possess remarkable optical properties. "Our technique can rapidly generate amazing nanoparticle assemblies over areas as large as a silicon wafer," says Xu, who also holds a joint appointment with the University of California (UC) Berkeley's Departments of Materials Sciences and Engineering, and Chemistry. "You can think of it as pancake batter that you can spread over a griddle, wait one minute and you have a pancake ready to eat." Xu is the corresponding author of a paper describing this research in Nature Communications titled "Rapid fabrication of hierarchically structured supramolecular nanocomposite thin films in one minute." Co-authors are Joseph Kao, Kari Thorkelsson, Peter Bai, Zhen Zhang and Cheng Sun. Nanoparticles function as artificial atoms with unique optical, electrical and mechanical properties. If nanoparticles can be induced to self-assemble into complex structures and hierarchical patterns, similar to what nature does with proteins, it would enable mass-production of devices a thousand times smaller those used in today's microtechnology. Xu and her research group have been steadily advancing towards this ultimate goal. 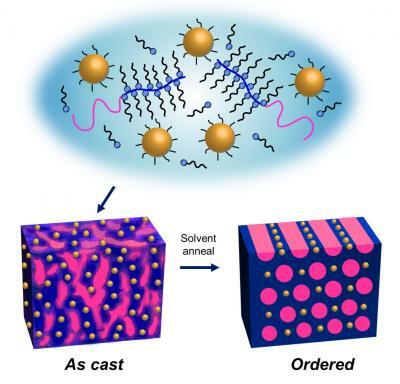 Most recently their focus has been on the use of block copolymer-based supramolecular solutions to direct the self-assembly of nanoparticle arrays. A supramolecule is a group of molecules that act as a single molecule able to perform a specific set of functions. Block copolymers are long sequences or "blocks" of one type of monomer bound to blocks of another type of monomer that have an innate ability to self-assemble into well-defined arrays of nano-sized structures over macroscopic distances. "Block copolymer-based supramolecules self-assemble and form a wide range of morphologies that feature microdomains typically a few to tens of nanometers in size," Xu says. "As their size is comparable to that of nanoparticles, the microdomains of supramolecules provide an ideal structural framework for the self-assembly of nanoparticle arrays." "To be compatible with nanomanufacturing processes, the self-assembly fabrication process must also be completed within a few minutes to minimize any degradation of nanoparticle properties caused by exposure to the processing environment," Xu says. 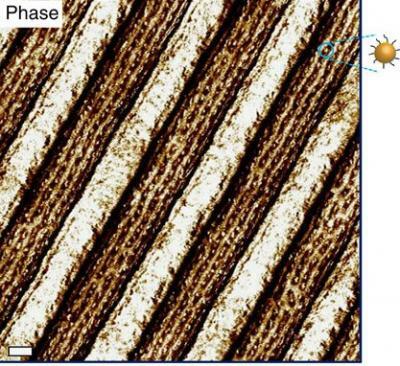 "By constructing our block copolymer-based supramolecules from small molecules non-covalently attached to polymer side chains, we changed the energy landscape so that solvent content became the most important factor," Xu says. "This enabled us to achieve fast-ordering of the nanoparticle arrays with the addition of only a very small amount of solvent, about 30-percent of the fraction of a 200 nanometer thick film." "Our gold nanocomposite thin films exhibit strong wavelength- dependent optical anisotropy that can be tailored simply by varying the solvent treatment," Xu says. 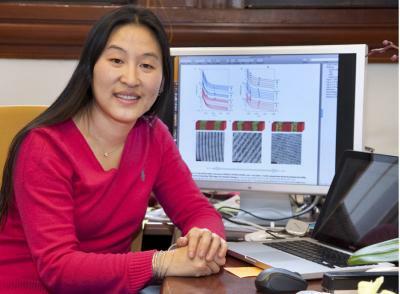 "This presents a viable alternative to lithography for making metamaterials." "We should be able to create a library of nanoparticle assemblies engineered for light manipulation and other properties," Xu says, "using a technique that is compatible with today's most widely used nanomanufacturing processes, including blade coating, ink-jet printing and dynamic zone annealing."